QUETTA, Pakistan — Suspected Sunni extremists executed 13 Shiite Muslims after ordering them off a bus and lining them up Tuesday in southwestern Pakistan, ramping up a campaign of sectarian violence that has exposed Islamabad’s inability to protect minorities. Sunni militants with links to al Qaeda and the Taliban have carried out scores of bombings and shootings across the country against minority Shiites in recent years, but this summer has been especially bloody in Baluchistan province, with at least four major attacks since May. The gunmen who attacked Tuesday were riding on motorbikes and stopped a bus carrying mostly Shiite Muslims who were headed to work at a vegetable market on the outskirts of Quetta, the capital of Baluchistan province, said police official Hamid Shakeel. The attackers forced the people off the bus, made them stand in a line and then opened fire, said Shakeel. The dead included 13 Shiites and one Sunni, he said. Six people were wounded — four Shiites and two Sunnis. 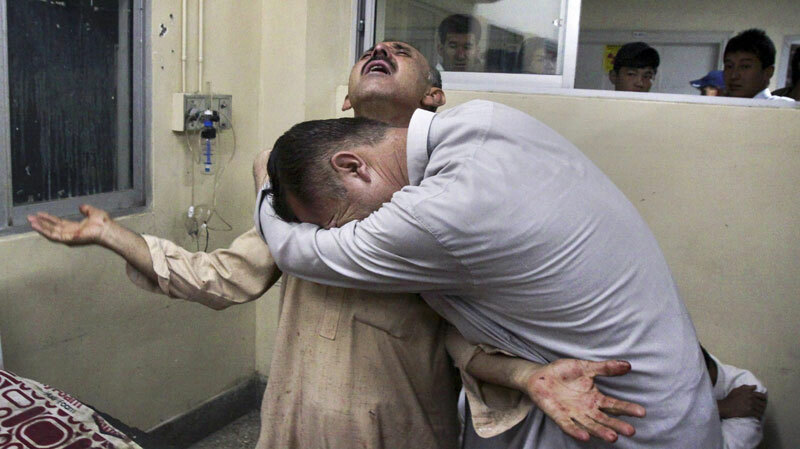 Local TV footage showed relatives wailing at the hospital where the dead and wounded were brought. One relative hugged a wounded man as another walked by, his clothes soaked with blood. Shiites blocked the main highway on the outskirts of Quetta to protest the killings. They also set fire to the bus that had taken the dead and wounded to the hospital. Sunni extremists carried out a similar attack on Shiite pilgrims travelling through Baluchistan via bus about two weeks ago, killing 26 people. Both incidents targeted the Hazaras, a Shiite tribe that lives in Pakistan and Afghanistan, where they have also been attacked by Sunni militants. Security forces in the Baluchistan region, who are also battling separatist rebels, have proved largely powerless to stop the violence. Pakistan is a majority Sunni Muslim state, with around 15 per cent Shiite. Most Sunnis and Shiites live together peacefully in Pakistan, though tensions have existed for decades. In the 1980s and 1990s, Pakistan became the scene of a proxy war between mostly Shiite Iran and Sunni Saudi Arabia, with both sides funneling money to sectarian groups that regularly targeted each other. The level of sectarian violence has declined somewhat since then, but attacks continue. In recent years, Sunni attacks on Shiites have been far more common. The groups have been energized by al Qaeda and the Taliban, which are also Sunni and share the belief that Shiites are infidels and it is permissible to kill them. The Sunni-Shiite schism over the true heir to Islam’s Prophet Muhammad dates back to the seventh century. Lashkar-e-Jhangvi, one of the country’s most ruthless Sunni militant groups, claimed responsibility for the attack in Baluchistan two weeks ago. One of its alleged leaders, Malik Ishaq, was released from prison on bail in July after being held for 14 years on charges, never proven, of killing Shiites. Ishaq was re-arrested about a week ago after making inflammatory speeches against Shiites in the country. He was not charged but detained under a public order act, which means he can be held for three months. It’s not clear whether Ishaq’s speeches have been connected to the recent wave of sectarian attacks. Click here> Angry MPs call for resignations over Balochistan killings..
ISLAMABAD: The National Assembly was outraged across party lines on Tuesday by the killing of at least 13 people in a sectarian attack near Quetta, with some government allies demanding that the interior minister and the Balochistan chief minister resign and the federal government impose governor’s rule in the troubled province. ….. eDAWN. <Click here.